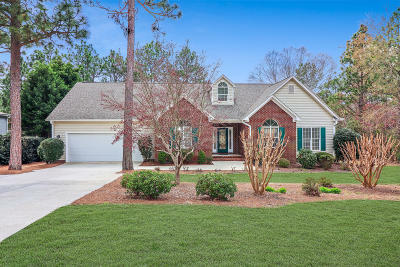 WATERFRONT HOME WITH TRANSFERRABLE PINEHURST COUNTRY CLUB MEMBERSHIP! Located in Pinehurst # 6, this single level, split-plan home is move in ready! Formal dining off foyer, updated kitchen with granite countertops, stainless appliances and breakfast bar overlooking eat-in kitchen and living room with gas fireplace. Oversized windows allow abundant natural light to stream in and clear views of the water. Features include three bedrooms, 2.5 baths, office, screened porch and deck. Low maintenance yard with crepe myrtles, Japanese maple and camellias. This home is a clean slate with fresh paint throughout! The master bathroom has been recently updated with tiled shower, soaking tub and dual vanities and large walk in closet. This home won't last long!